Jacob 'Jack' Sebastian Heit was born on February 5, 1914 in Tramping Lake, Saskatchewan. He moved to Sudbury, Ontario, travelling by train at a cost of $6, and arrived on March 25, 1938. Heit took many odd jobs such as seasonal mail deliverer during the Christmas season in 1939 or work for Pioneer Construction in 1940. Other odd jobs included 'pick and shovel' work, farm work, house construction, cement drilling, and steel jobs. He worked for firms such as Red Brown Cement Products, Gustiana Company, and A.L. McGinn using his skills as a mechanic and blacksmith. He began his career at Falconbridge Nickel Mines Ltd in 1941 underground as a miner. He later became an Inspector for Mine Safety and First Aid. Heit was certified in basic Mine Rescue Training at the Sudbury Rescue Station in June 1948. By 1951, he received the Advanced Mine Rescue Training and in 1961 the Supervisory Advanced Mine Rescue Training. In May 1950, Heit was a member of the winning team of the inaugural First Aid Championship of Falconbridge Nickel Mines at a competition held in the Community Hall. Heit continued to compete in both local and Northern Ontario mine rescue competitions and won several times. Awards included the H.J. Fraser Trophy for defeating the top plant first aid team at Falconbridge. Heit was also an avid volunteer with the Garson Volunteer Fire Department for 20 years (circa 1950 to February 1971). When Heit resigned from the fire department, he held the position of 'deputy fire chief.' 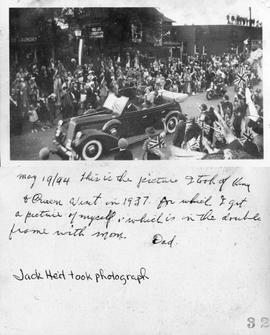 He was also an amateur photographer and won 1st prize for the best photograph of the King and Queen's visit to Sudbury in 1939. Jack Heit married Katherine 'Kay' Kraft (born March 4, 1918 in Allan, Saskatchewan) on February 5, 1940 at Christ the King Church in Sudbury, Ontario. They had five daughters, Diana (1941), Janet (1943), Marilyn (1947), Kathy (1948), and Susan (1954). Heit retired from Falconbridge Ltd in 1976. He remained active in the community with bridge games, curling, and water skiing. For their 50th wedding anniversary, Jack and Kay Heit renewed their vows at the same church they were originally married. Jack Heit passed away on November 5, 1999 at the age of 85 at Extendicare York in Sudbury, Ontario. Sous-fonds consists of photographs and various textual material mostly pertaining to Jack Heit's employment and involvement in Mine Rescue.